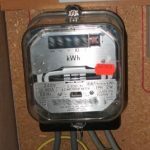 I have heard back from my electric supplier’s micro-generation department with reference to my meter that is running backwards when solar electric is being generated. Although I have now become fond of this newly discovered solar installation feature! they have confirmed that the meter is indeed an old unit and no longer suited for my property and that it will be changed over next week. Has your meter been changed yet? We’ve heard lots of stories of meters remaining in place despite being reported many months previously.